The Signature Command System is the most feature enhanced and energy efficient collection of fireplace components on the market today. Unlike any other fireplace available, the addition of Signature Command gives you the control to make your fireplace the most energy efficient and convenient to operate. Featuring an electronic ignition system and the option of cold climate pilot and flame height control at the touch of a button, automatic battery backup system, accent lighting control and blower speed with time delay control, you'll enjoy the comfort of your fireplace like never before. And, with our innovative Touch Screen thermostat remote control including the "Smart Mode" feature, your fireplace will be the most energy efficient Green fireplace system on the market today. 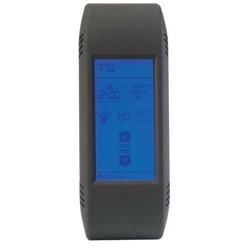 "Smart Mode" Thermostat: There are two touch screen remotes - TSTSC, TSFSC - that feature the "Smart Mode" thermostat option. This feature automatically adjusts the flame height (Hi/Med/Low) to keep an even and more comfortable room temperature while operating the fireplace at its peak efficiency by monitoring and adjusting automatically to the room temperature. If a blower is used it also can be controlled (Hi/Med/Low) automatically along with the flame height. Just sit back and enjoy the comfort and savings and let the "Smart Mode" thermostat do all the thinking for you. Review: I am so glad we decided to spend a little extra money for the Signature Command remote system. What a convenience to be able to control everything from the comfort of my couch. I highly recommend it.